However, the energy generated via the wind and solar sources is affected by weather, location, and time. Batteries used at wind turbines and in solar panels smooth the variabilities and store energy for future use. The prevailing safety issues, the resistance from utilities, and regulatory barriers have restricted the integration of these batteries into mainstream power systems. Electricity grids are undergoing modernization with the implementation of power flow measurement and controlling power production & distribution and are gathering information on electricity use. Storage is a major barrier to the adoption of renewable energy. 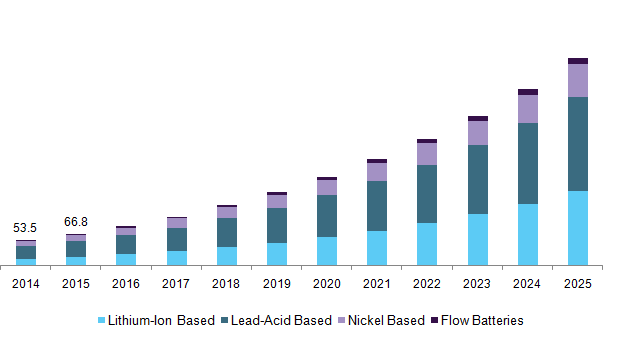 Several battery technologies including lead-acid, lithium-ion, and sodium sulphate have been developed and tested for applications such as grid investment deferral and arbitrage. Energy storage systems (ESS) aid in storing renewable energy sources for further commercial use. The increasing demand for ESS is expected to augment the market demand over the forecast period. Lead-acid batteries are the most commonly used battery types in ESS, owing to applications such as standalone battery systems used to handle output fluctuations from the wind and solar power.